The internet is a miraculous tool. Type in a question and the majority of the time you will find the answer. Sometimes the answer comes in the form of a blog post, other times you can find an entire video answering your specific question. However, despite being extremely powerful, there are some questions that are too specific or hard to articulate that Google simply cannot fetch a simple answer for. Enter Quora. Quora is a crowd-sourced Question and Answer platform that allows users to post a question and have the community submit answers and vote on which answers are best. In this regard Quora sounds much like any other Q&A site out there but there is a major difference: the people on Quora aren’t 11 year old trolls. Quora can be summarized thusly: Yahoo Answers but with the exact opposite quality of answers. The average Quora user appears to be rather well educated with a demographic that appears to skew heavily towards a variety of professionals; whether they operate in the tech, science or general business space. What this means is that you get insightful answers to very specific and often technical questions — questions that Google cannot easily answer. Specific questions like: What is the best way to redirect a single page URL to the same page with a different URL? The site has already accumulated a large user base and, while there are plenty of trolls, the site has remained intellectual with reputable answers. The site’s power lies in its crowd-sourcing nature. Instead of typing a query into Google and hoping it can find an answer to your obscure question, you are able to put your question out in front of thousands of intellectuals to tap into their knowledge. What is even better about the platform is the ability to identify your skills and knowledge and follow topics of interest so that you can share information on topics that you are well versed in. For example, I have used the site many times to get answers to questions about developing my wedding site, since weddings are not generally my forté, while answers questions about marketing, technology and social media. Quora is now my number 2 source of information with Google Search still holding the number one spot. 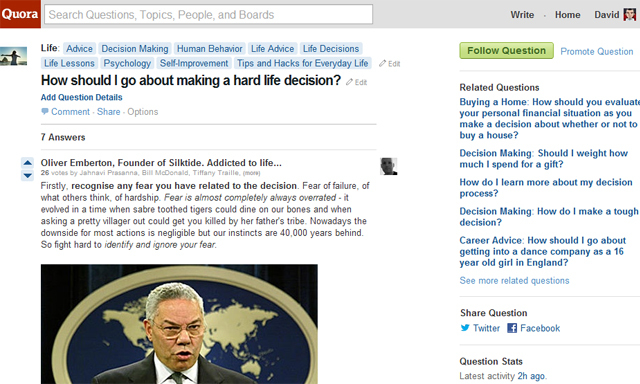 I thought I would share because I think many others will find as much success with Quora as I have. Imbeciles need not apply. Previous postCuriosity – The Cube Destroying Game!